Description: Moderate-sized (10-14mm) black ground beetle. Eurytopic i.e. occurs in most habitats but particularly under stones in woodland and dense heather moorland. Very common throughout. World Distribution: A European Wide-temperate species (63) found throughout Europe to the Caucasus and Asia Minor. Abundant throughout the British Isles. Ecology: One of the most abundant species in disturbed or synanthropic situations. Usually found in partially shaded, hedgerow or woodland habitats but eurytopic and absent only from very saline or very wet situations. 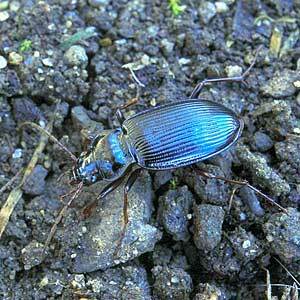 Replaced by Nebria salina in some drier habitats, including peatlands and the summit moraine of mountains. Remarks: Rufinistic forms occur frequently and completely orange-brown or rufous specimens have been recorded.